Battle of the Falklands Day is a public holiday in the Falkland Islands celebrated on December 8. It commemorates the Battle of the Falkland Islands that occurred on December 8, 1914 during the First World War. The battle was the second major naval engagement of the war. 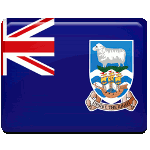 The archipelago of the Falkland Islands is a British overseas territory located in the South Atlantic Ocean. During the First World War, Port Stanley was an important coaling station for the Royal Navy therefore ships based there were involved in major naval engagement in WWI. The Battle of the Falkland Islands took place on December 8, 1914. After their defeat in the Battle of Coronel (November 1, 1914) the British sent a large force to hunt down and destroy the German squadron. Britain won a decisive victory. Germany lost six out of eight ships; 1,871 people (including Admiral Maximilian von Spee) were killed and 215 were captured. Britain lost only 10 people and no ships. Battle of the Falklands Day is commemorated with an official ceremony and parade. It is a very important event for the islanders. Canopus Hill located south of Port Stanley commemorates HMS Canopus, which fired the first shots in the Battle of the Falklands.